MADISON — Partnership for a Healthier America’s FNV initiative in conjunction with the University of Wisconsin-Extension FoodWIse, healthTIDE and the Wisconsin Department of Health Services, has won the National Centre for Social Marketing’s (NCSM) Award for Social Marketing for its use of social marketing to impact public health. The FNV “fruits and veggies” campaign promotes increased consumption of fruits and vegetables to alter the behavior of young adults across America. The international award was presented at the 2018 University of South Florida Social Marketing Conference on June 29. In Wisconsin, FNV engineered its messaging around resident’s relentless support of its local sports teams. Advertisements featuring gold bell peppers and broccoli with the headline “Die Hard Fans Eat Green And Gold,” celebrated the Green Bay Packers, while the headline “Root, Root, Root for the Home Team,” featuring root vegetables pays homage to the Milwaukee Brewers. For example, FNV in Wisconsin augmented efforts to improve the access and affordability of fruits and vegetables, according to the priorities of its funder, the Supplemental Nutrition Assistance Program Education (SNAP-Ed). In Milwaukee, billboards displayed near farmers’ markets that accept SNAP benefits read, “At the Market, A Little Bit of Green Goes a Long Way,” featuring images of fresh green vegetables. Geo-location was also used to deliver digital formats of these ads to consumers. In 2017, Partnership for a Healthier America and the collective of Wisconsin-based partners worked with more than 60 community organizations and retailers, placed more than 15 billboards, served 17,552 transit impressions and received 23 million digital impressions and 14 million social media impressions. Partners also planned FNV activation at the Wisconsin State Fair, a minor league baseball game, a summer concert series, kids’ day event and farmers’ market. Preliminary survey results suggest the FNV campaign may be shifting attitudes and behavior in Wisconsin. Those who saw FNV ads had more positive attitudes towards fruits and vegetables and reported eating more fruits and vegetables and consumed them with increased frequency. Partnership for a Healthier America continues to widen its breadth of impact by using FNV to serve new communities and alter the behavior of more consumers. The Wisconsin campaign is expanding to include 11 new communities in 2018 and has developed new Spanish-language messages. Results are forthcoming. The Partnership for a Healthier America (PHA) is devoted to working with the private sector to ensure the health of our nation’s youth by solving the childhood obesity crisis. In 2010, PHA was created in conjunction with—but independent from— former First Lady Michelle Obama’s Let’s Move! effort. PHA is a nonpartisan, nonprofit organization that is led by some of the nation’s most respected health and childhood obesity experts. PHA brings together public, private and nonprofit leaders to broker meaningful commitments and develop strategies to end childhood obesity. Most important, PHA ensures that commitments made are commitments kept by working with unbiased third parties to monitor and publicly report on the progress our partners are making. For more information about PHA, please visit www.ahealthieramerica.org and follow PHA on Twitter @PHAnews. The National Social Marketing Centre (NSMC) is the centre of excellence for social marketing and behaviour change based in the UK. Established by Department of Health England in 2016, it became an independent not-for-profit in 2012. The NSMC’s mission is to maximise the effectiveness of behaviour change programmes across the globe. The NSMC now works worldwide on a range of health and environmental behaviour change programs. FoodWIse, a program of the University of Wisconsin-Extension, is federally funded by the Supplemental Nutrition Assistance Program-Education (SNAP-Ed) and the Expanded Food and Nutrition Education Program (EFNEP) and serves Wisconsin residents with limited incomes. FoodWIse employs a combination of evidence-based educational strategies, accompanied by environmental supports, designed to facilitate voluntary adoption of healthy food choices and active lifestyles. The Wisconsin Department of Health Services, Chronic Disease Prevention Program provides a coordinated approach to identifying health risk behaviors, environments, and systems associated with diabetes, heart disease, stroke, and obesity. The Program’s work impacts all ages and multiple sectors including early care and education, schools, worksites, health care, and the community. State and local partnerships align and coordinate strategy implementation to achieve measurable health impacts. During the 2018 Area Animal Science Days in Kewaunee, Clark and Lafayette Counties, youth judged breeding and market classes of swine, beef, sheep and, in some locations, meat goats. Youth also answered a sets of species questions and seniors judges gave oral reasons on selected classes. 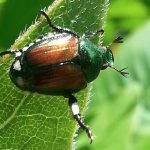 PJ Liesch explains how to identify Japanese Beetles and describes the damage they do to plants.